Most people want to be successful in life. There are goals set and then the hard work begins to reach those goals. The question is what is success? Actually, success can mean different things to different people. For example, a person that owns their own oil changing service for vehicles might set their level of success at servicing 50 cars a day while someone who loves music might consider success as cutting their own CD. In addition, success does not always have to involve money. Success could be getting a good grade in a difficult class or learning how to bake the perfect chocolate cake. Success is important and it takes work to reach. Regardless of what your specific success is, there are ways to surpass your goal. We have put together 50 tips that can be used for any success. These are ways to better yourself as a person, proven methods you can apply to reach success. However, if you love working on cars and have a real talent for fixing engines and ransmissions, and to you, success would mean working for NASCAR, you have potential to learn and achieve that success. Create a Business Plan as your very first step if you are planning to build a business. Whether you will be searching for investors or not, this plan will be the blueprint to your success. The Business Plan will consist of market trends, financial planning, competitive analysis, exit strategies, marketing and promotional options, everything about your goal. When going before an investor, you will be required to have a Business Plan. This is by far the most important document of all. If your success were something personal, you would not need to create a Business Plan although a project plan would be a good option to allow you to keep track of everything involving your goal. You might think there is no correlation between complaining and success when in fact there is a connection. When you are spending time complaining about the obstacles you are facing, you are wasting so much time being negative that you are actually loosing chances to move forward. Instead of thinking of challenges as problems, think of them as opportunities. To increase your chance of succeeding, you should concentrate your efforts on something you enjoy. When you start out, make a list of everything you find interesting. Then in a second column, write down the skills you have in relation to each of those items. This will help you narrow choices down based on interest and skill, which gets you started in the right direction for success. You have a choice in life to accept your position or change it. If you choose to plug along in life hoping that something will change for the better, you will not get very far. Always remember that when it comes to changing your circumstances, you can – you have that power. As an example, women who are in abusive situations often feel controlled and powerless to get out of the situation. They have the same choice of changing their circumstances as you do. If your circumstances lower the chances of success, you need to change them. Even if it is flimsy to begin with, you should construct a plan to include goal, milestones, deliverables such as contracts, business plans, etc., and accomplishments. This will provide you with a visual as to what you are working for, what milestones you have successfully met, and where you need to do better. You need to accept responsibility if you make a bad decision or fall behind in your plan. Let us say that you have set some firm milestones that need to be accomplished in order for you to move to the next step. However, you got tired of working hard and took some time to play, which is fine as long as it does not affect your goals. Now months have passed and you are way behind schedule. This delay has closed several doors of opportunities. Who is to blame? A positive mind and happy, upbeat attitude will help you succeed. It has been proven in many studies that a person living in a happy state generally gets much further in just about everything they do. This relates to attitude. Just as bad attitude can pull you down, good attitude and a happy, healthy mind will help you meet your objectives. An old cliché states, “Anything worth doing is worth doing well.” This should be your motto. When you want to succeed, you cannot afford to take shortcuts. Depending on what your specific success is, it may take courage to arrive at your desired destination. For example, if you have a dream of being a writer and to you, that is success, but according to your long line of family members who have all gone on to be doctors, the only success in their minds is if you follow down the medical path. This means you will have to have courage to stand up for what you believe and desire to do, even if it means disappointing family. As you work toward your specific success, always enjoy opportunities to learn, even if it takes longer than you think it should. Although this may be more at the end of the process, it is important. When you finally do reach your success, use your experience to teach, guide, and mentor others so that they too might succeed. Whatever your idea of success, conduct a “sanity check” throughout the process of reaching your goal. This should be done with someone you trust and who is themselves successful. Ask them to provide honest feedback about your success and as you move through different milestones, bounce concerns or new ideas off them to help keep you on the right track. No, we are not talking about actual poison but toxic people that can poison. Unfortunately, it would be great if close friends or co-workers could share in your success but all too often, there will be someone who is either dealing with the “green monster” of jealousy or has a case of the “I knew that” syndrome. If you are serious about reaching your goal and being successful, you will need to rid your life of these people. While you may not be able to get them out of your life completely, you should avoid them as best as possible. If this is a person, you see every day, keep your goals to yourself, and avoid that specific subject. To succeed, you need to learn how to listen first. Pay attention to other people who have enjoyed successes in their life, attend seminars given by people that can motivate and encourage, or be open to hearing that a particular idea is not a good one. Good listening takes time to learn but in the end, it will be your greatest tool. If you have a goal of being a best-selling author, find friends and mentors who either have achieved that same goal or are also pursuing a successful writing career. It is important to surround yourself with people that can associate with your goal and passion, people who understand the burning desire to succeed and can encourage when you meet with disappointments. Do you remember the story of the caboose that was desperately trying to make it over a very large hill? He kept telling himself repeatedly, “I think I can, I think I can.” When you start feeling overwhelmed or defeated, tell yourself aloud these same words. While it may take time to learn how to identify ways to avoid obstacles or failures, get into the habit of tackling problems before they arise. This will help you avoid wasting precious time on your road to success. When striving for the big goal of success, it is critical to stay motivated. Find inspiring and motivational tapes, seminars, books, movies; whatever you are able to get your hands on. When you start to feel a little down and out and doubt starts to creep in, turn to these motivational tools to help you keep on track. A few excellent motivators include Tony Robbins, Norman Vincent Peale, Jim Rohn, Zig Ziglar, and Les Brown. While being determined is important, do not be so hard on yourself that you become critical of every move you make. Give yourself some room to make mistakes and be flexible with you. That does not mean you can miss goals but it does mean that if you do, you find out how to avoid that from happening again and then get back to business. Fall in love with what your success. Okay, although that sounds funny, you need to have an intimate passion with your interest. You can do this regardless of what your success is. By having passion for what you are doing and driving toward, you will automatically put more effort into it. Passion is a good thing as long as it does not become an obsession. If you have a goal of becoming a world-famous chef and you know you have both desire and skill, do not just settle to become a short order cook at your local family-style restaurant. While that may be good training ground, do not allow yourself to lose sight of your ultimate goal. Many famous actors, music artists, inventors, etc., had special challenges ranging from learning disabilities to physical disabilities. Take Beethoven for example. He was born deaf yet he went on to be one of the world’s greatest composers or Joni Erickson who was paralyzed from the neck down yet she learned to paint with her mouth. Today, her paintings are famous around the world and worth millions. If you are faced with a special challenge of your own, while you may have to adjust things from time to time, do not use excuses. If you want something bad enough, there is a way! Being afraid of failure is a normal emotion for every person on the planet. How you get past that fear is the determining factor between failing and succeeding. You can do that by setting realistic goals and then examining those goals on occasion to do any necessary realignment. Above all, believe in yourself and the desire burning within. Succeeding takes time. A goal worth setting will take time to achieve. Be patient with yourself, the people around you, and the process it takes to become successful, also referred to as “paying your dues.” Just like the chef scenario, it takes time to be a master chef. Pay your dues by learning and working your way up the ladder to success. Being successful also means keeping to a schedule. In addition, you need to learn how much is too much. Good time and resource management will help you ensure that you use your time wisely and that you are not adding third portions onto a plate still overflowing with seconds. Rather than wait for opportunity to find you, you need to find opportunities. This might be watching for business opportunities in the paper regarding small businesses being sold, great real estate opportunities, and investments with stocks, bonds, or mutual funds, taking a talent and turning it into an entrepreneurial adventure. People that have reached financial status will tell you that they look for ways to seize opportunities, not wait for opportunities to come knocking on their door because it will not happen that way. Putting yourself in the right attitude for success should be at the top of your list. Staying positive and surrounding yourself with friends, that share a positive attitude will help you succeed. You need to adopt the attitude that life is half-full. The result is that you will feel better, have more energy, and have a much higher opportunity for success. You need to be thankful for not only your accomplishments but also your failures. Having a grateful attitude is important. It will help you stay humble, which in turn, will help you continue striving for the ultimate in success. As you work hard to reach success, regardless of what you consider that success to be, you need to be able to see your accomplishments. Start a journal and track everything you have conquered. When children do something great, parents will reward them with something nice, whether a kind word of encouragement or a new toy. When people do well in their job, they get raises. As you surpass your milestones, reward yourself. Treat yourself to something nice – a new dress, a new fishing pole, whatever you like, be sure to award yourself for a job well done. Whether you are just starting out or expanding an existing business, unfortunately, there are thousands of people waiting to defraud you out of money. If something appears too good to be true – IT IS! Always conduct thorough research and never jump into opportunities that look perfect. If someone becomes pushy, wanting you to make a quick decision on any type of investment, do not walk away – RUN away! As you make your way toward success, you will be challenged with big obstacles as well as small obstacles. Pick your battles wisely. While you need to resolve the small issues, do not dwell on them and lose precious time and energy when you should be focusing on the bigger picture. Try to live every day as though it were your last. Make the most of every day and accomplish something. Even if it is something small, every baby step adds up to a huge success in the end. You should look at every angle of your journey as an exciting adventure. When you think of your childhood years, you loved investigating the unknown. Carry this with you as you strive toward success. Anticipate the excitement of each accomplishment – make it a real adventure. Especially when things are small and do not appear to have a major impact on the big picture, you need to ensure you follow through and complete your tasks. Those little things can quickly add up to a big mess if not taken care of in a timely and efficient manner. If you have people helping you out, whether on a volunteer basis or a full-time employee, always offer praise. These people are an important part of your success and by providing praise and support; in return, they will show dedication and work hard to help you reach your goal. In order to visualize your accomplishments and stay encouraged, you need to set daily goals. These goals can be as simple as a follow up phone call or a written letter to an investor. Whatever the task is, get it done. In addition to keeping the process for your success on track, it will help you to feel like you are making accomplishments, pushing you closer and closer to the success. More than likely, you will reach various times when you do not have the appropriate expertise to accomplish something. This is the time collaboration and/or networking is valuable. Keep your line of communication open with your customers. If they have a problem, show them the deserved respect and resolve the issue quickly. Make occasional phone calls to see if they have any needs. This will let your customers know that you are there for them and care about their business. This relationship is what is going to keep you on the road to success. After all, the customer is your link between failure and success. On occasion, reflect on what you have accomplished as well as your open milestones and ensure you are still heading in the right direction. Repositioning along the way to success is perfectly normal and to be expected. You may have been struggling with something specific. Rather than continue battling this issue, reflect on what has not been working, and reposition yourself so you do not have to keep battling the same things repeatedly. You and you alone are responsible for your success. While you will have help in many instances, the bottom line is that you are responsible. You need to be surrounded by the right people, working with the right investors, going about meeting your success in the right way. It is you that will make the choices and therefore, your responsibility to make the right choices. In other words, your desire for success must always be greater that any obstacle that stands in your way. Regardless of what your goal for success is, get involved with your community. First, get involved with town meetings, the local Chamber of Commerce, and attend community functions. You will be amazed at the opportunities for support, business ideas, and financing available right there in your own neighbourhood. Always keep your records up to date. This would include contact information, investor information, Business Plans, attorney information, accounting, everything you touch regarding your goal. In addition, keepy our files on your computer backed up and current. First, you never know when you are going to be asked for a specific document and need to provide quick turn-around. Second, computers do crash and it would be a disaster if all of your information were suddenly gone. Take time to get any debts paid off, especially credit card debts that will cost you a fortune in interest. This is especially important if you will be seeking funding as a part of your particular success. You want to ensure that your records and credit are clean if you need to make a presentation before an investor, asking for money. Stay current with the industry news that your goal falls in. Learn about current trends, company failures or successes, new ideas; whatever information you can find. For example, if you have decided to open a retail store and have a great idea and a real passion for your goal, read about that specific type of store, location, potential revenue, downfalls, everything. This information will be a part of your business plan and is crucial. 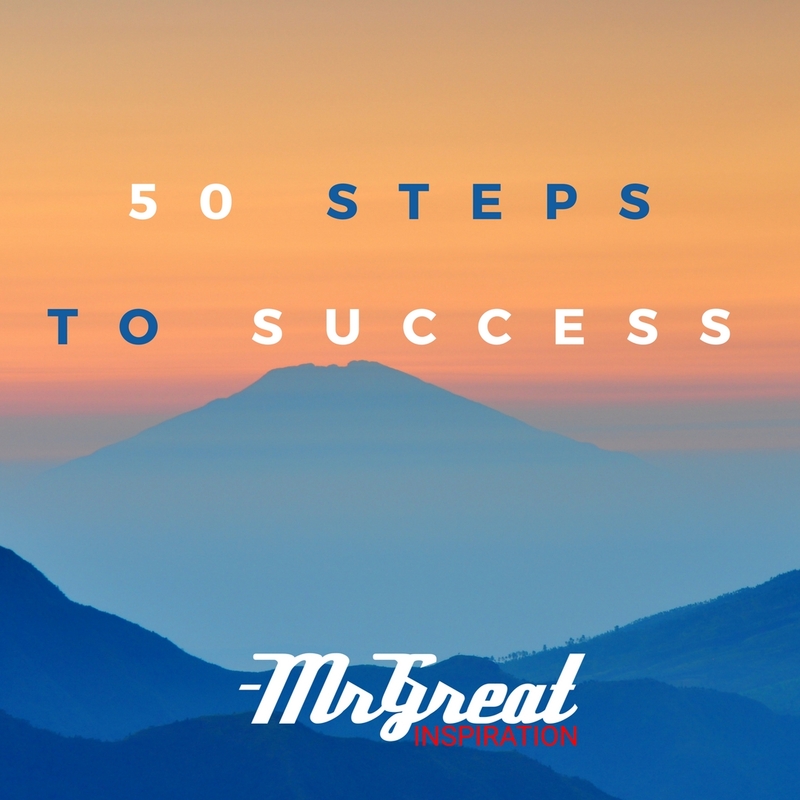 We hope guys you find our article "50 Steps To Success" by Mr Great Inspiration useful. If you think we have made some efforts, then don't forgot to appreciate us by sharing this inspirational article with your friends and family, And thanks for visiting.